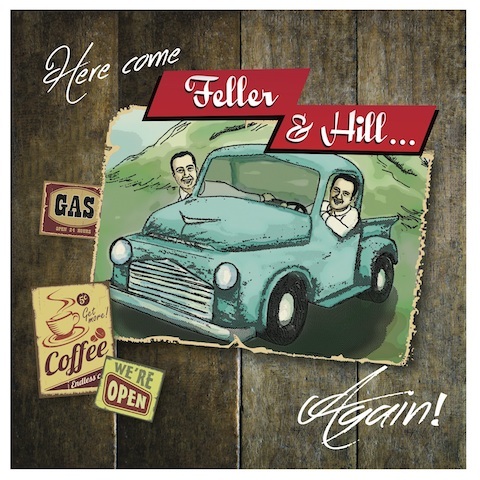 Feller and Hill have announced the release of their second album, on the Blue Circle Record Label, titled “Here Come Feller and Hill….Again“. Following the success of their debut album, “Feller and Hill and the Bluegrass Buckaroos”, the new album promises to have the same focus on vintage harmonies, instrumentation, and quality songwriting that this dynamic duo is becoming known for, in the bluegrass community and beyond. The first single from the new album, “The Government Blues“, written by Tom T. and Dixie Hall, which was released on November 26, 2013, has already been working its way up the charts and has been featured on Sirius XM radio’s Bluegrass Junction show, in recent weeks. The song is a light-hearted look at real situations, dating back to the Depression Era, but some that still ring true today. The single recently reached the number seven slot on the BluegrassToday charts.